See The Future of Soil Stabilization on April 13, 2010! Seminar offered at no charge. In Iowa and around the world, soil is going high-tech! Join us for Soil Stabilization 101: Solid Facts On Fly Ash, a one-time opportunity to learn more about the speed, cost savings and performance of today’s most advanced soil stabilization processes. Attendees can earn general engineering Continuing Education Units! Sponsored by GEOMAX Soil Stabilization, Soil Stabilization 101 is a high-level educational experience that features over six learning sessions including presentations by experts from Terracon Consultants, Alliant Energy and Iowa State University’s Earthworks Engineering Research Center (EERC), and more. Plus, you’ll see a live soil stabilization demonstration, learn about best practices from an informative panel of experts, and have the opportunity to walk through ISU’s Mobile Lab! You’ll walk away knowing when, where, why and how this process should be used. You’ll gain a deeper understanding of the industry’s most effective soil stabilization processes. For more information or to register, call Jim or Deborah at 319.354.4114. 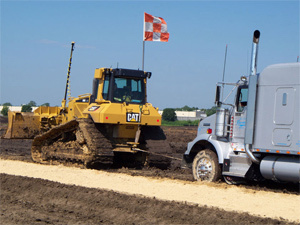 Based in Iowa City, Iowa, GEOMAX Soil Stabilization provides the construction industry with sustainable, state-of-the-art soil stabilization for paving sub-grades and construction building sites. The company’s geo-technically engineered soil bases are cost-effective and help to accelerate production schedules.